The opportunity to measure the gravitational waves of two merging neutron stars could offer answers to some of the fundamental questions about the structure of matter. At the extremely high temperatures and densities in the merger, scientists have conjectured a phase transition in which neutrons dissolve into their constituent quarks and gluons. In the current issue of Physical Review Letters, two international research groups report on their calculations of what the signature of such a phase transition in a gravitational wave would look like. Quarks, the smallest building blocks of matter, never appear alone in nature. They are always tightly bound inside protons and neutrons. However, neutron stars weighing as much as the sun, but being just the size of a city like Frankfurt, possess a core so dense that a transition from neutron matter to quark matter may occur. Physicists refer to this process as a phase transition, similar to the liquid-vapor transition in water. In particular, such a phase transition is, in principle, possible when merging neutron stars form a very massive meta-stable object with densities exceeding that of atomic nuclei and with temperatures 10,000 times higher than in the sun's core. The measurement of gravitational waves emitted by merging neutron stars could serve as a messenger of possible phase transitions in outer space. The phase transition should leave a characteristic signature in the gravitational wave signal. The research groups from Frankfurt, Darmstadt and Ohio (Goethe University/FIAS/GSI/Kent University) as well as from Darmstadt and Wroclaw (GSI/Wroclaw University) used modern supercomputers to calculate what this signature could look like. For this purpose, they used multiple theoretical models of the phase transition. In case a phase transition takes place more after the actual merger, small amounts of quarks will gradually appear throughout the merged object. 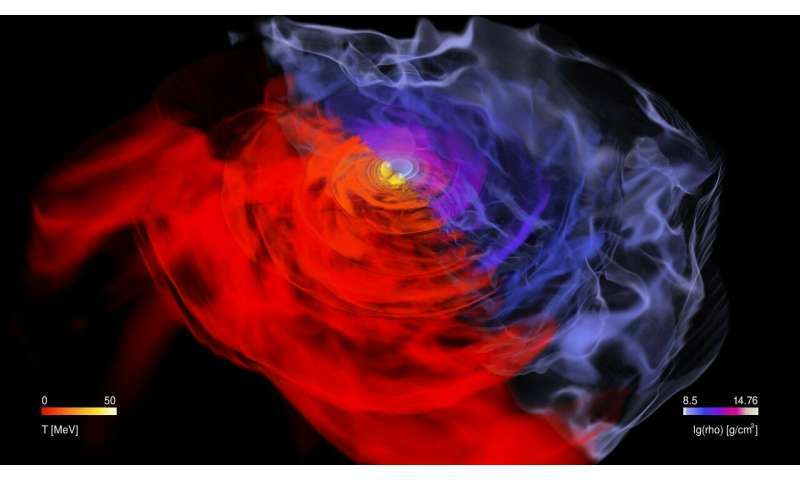 "With aid of the Einstein equations, we were able to show for the first time that this subtle change in the structure will produce a deviation in the gravitational wave signal until the newly formed massive neutron star collapses under its own weight to form a black hole," explains Luciano Rezzolla, who is a professor for theoretical astrophysics at the Goethe University. In the computer models of Dr. Andreas Bauswein from GSI Helmholtzzentrum für Schwerionenforschung in Darmstadt a phase transition already happens directly after the merger—a core of quark matter forms in the interior of the central object. "We succeeded to show that in this case there will be a distinct shift in the frequency of the gravitational wave signal," says Bauswein. "Thus, we identified a measurable criterion for a phase transition in gravitational waves of neutron star mergers in the future." Not all of the details of the gravitational wave signal are measurable with current detectors yet. However, they will become observable both with the next generation of detectors, as well as with a merger event relatively close to us. A complementary approach to answer the questions about quark matter is offered by two experiments: By colliding heavy ions at the existing HADES setup at GSI and at the future CBM detector at the Facility for Antiproton and Ion Research (FAIR), which is currently under construction at GSI, compressed nuclear matter will be produced. In the collisions, it might be possible to create temperatures and densities that are similar to those in a neutron star merger. Both methods give new insights into the occurrence of phase transitions in nuclear matter and thus into its fundamental properties.